Engineered for both silent operation and maximum airflow, BitFenix's Spectre LED PWM 140mm Case Fan will keep your CPU running cool without sounding line an airplane hangar. Spectre LED PWM Fans are designed with sickle fan blades that enhance airflow without producing excess noise and are outfitted with white LEDs. The on-the-fly LED light switching feature requires an optional BitFenix Hydra Pro Fan Controller or Survivor Chassis to turn the lights on and off with a press of a button. It can also be used as a regular LED fan with jumper-selectable on/off. Furthermore, this fan utilizes pulse width modulation technology that better cools your system by letting your computer adjust the fan speeds. Spectre LED PWM uses pulse-width modulation technology to adjust fan speeds. This technology enables your system to control cooling with precision as compared to conventional linear voltage fans, making them suitable for CPU coolers. 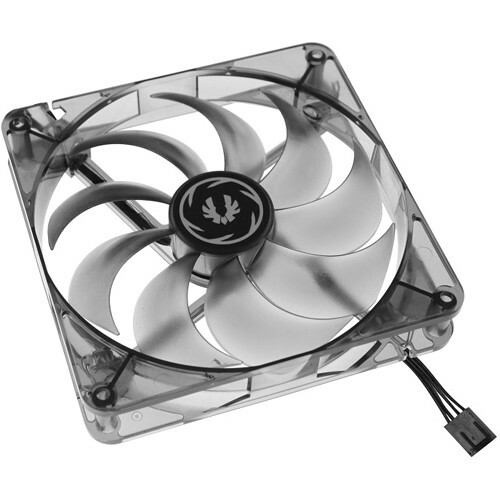 BitFenix Spectre LED PWM fans are designed to cool silently so you can keep you mind focused on the task at hand. Spectre LED PWM Fans feature sickle fan blades that create a torrent of air without creating excess noise. These blades allow your system to stay cool in the heat of battle without disturbing your computing environment. The white LEDs provide a unique look that highlights the design of your case. Spectre LED PWM Fans have on-the-fly light switching technology, which allow you to turn the fan lights on and off with the push of a button using compatible BitFenix chassis and accessories. Manufactured from a high-grade tinted polycarbonate resin, Spectre LED PWM Fans give a sleek dark look when off, while emitting bright light when the LEDs are turned on. Box Dimensions (LxWxH) 6.2 x 5.6 x 1.2"